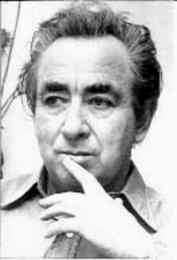 Pinhas Sadeh (1929-1994) was born in Lvov, Poland, and immigrated to pre-state Israel in 1934. He studied in Tel Aviv and the Jezreel Valley and then moved to Jerusalem where he worked as a night watchman and shepherd. Sadeh began writing in 1951. He published six collections of poetry, two novels, a novella, four books of diaries and essays, a children`s book and a collection of hassidic folktales. He also translated collections of poetry and novels. With no formal education beyond primary school, Sadeh consistently approached the most elementary existential issues in his writing. Referring to his work as "theological," he remarked that his writing was "a moral act." Combining mythological, autobiographical, mystical and metaphysical elements, there were those who saw him as a teacher and prophet. His style is spare, and emphasizes his desire to avoid all linguistic excess. His novel, Life As a Parable, is possibly autobiographical. Widely acknowledged as his classic work, it spawned a cult following among young adults. Sadeh received the Bialik Prize in 1990.